I like when contests do this. It’s smart. For those of us who entered and did not win, or did not make the finals, it’s a nice idea for the company running the contest to maintain a positive connection with these people who have a newfound and more intimate relationship to their products. What I mean is, I could be pissed at Doritos for picking 5 lame videos for their finalists. 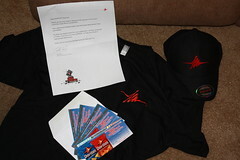 Instead, I’m happy with them for sending me a hat and t-shirt I probably won’t wear, and 5 free bags of Doritos that I can give away to my supporters for votes. I just reread that and I realize it sounds sarcastic, it honestly isn’t. The last taste in my mouth of the whole Doritos contest is a pleasant one – it’s them saying they appreciate the time it took everyone to make their entries, and they want to thank us with stuff. And a man can never have too many t-shirts.